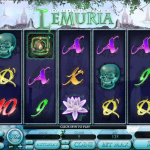 Microgaming software takes you on a trip to The Forgotten Land of Lemuria. Once a prosperous nation, the land was lost from the rest of civilization a long time ago. Now you get a chance to see what life is like for the local residents and how far they have prospered in comparison to the rest of the world. This is a modern video slot game with attractive visual details. The animations in the slot are great and the symbols have a high level of details. 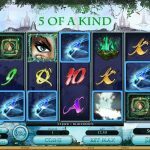 This is an intriguing slot game which is guaranteed to catch your attention at first sight. The slot has a Wild symbol which can land on every reel and will replace for all of the game symbols except for the scatter symbol. He has a maximum payout of 1.500 coins if 5 of them land on the reels. The scatter symbol in the slot has a very good 500 x stake payout if 5 of them manage to land on the reels. But more importantly the Scatter symbol triggers the bonus feature if 3 or more of them land on the reels. The Treasure Vault Feature is a coin based bonus game with three levels, Water, Earth and Fire. In each level the player will need to choose among 10 orbs. Each orb will reveal a random coin prize, progress to the next level or end the feature. The goal of the bonus game is to get as many coin prizes as possible and reach the last level of the feature. When the bonus ends all coin prizes are awarded to the player. 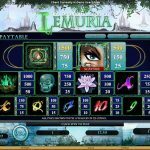 The Forgotten Land of Lemuria is a modern Microgaming slot which has a lot to offer in every way. The game has excellent visual details and an attractive bonus round which can pay big. The next game is just fun & funny, if you’re into those sort of stuff… Steam Punk Heroes a 5 reel slot by MicroGaming.